$269.99 & FREE Shipping on orders over $59. A complete setup for dispensing your homebrew like the pros. There are several advantages to a kegging system. The number one reason is that you no longer have to clean bottles. You will also enjoy drawing your own beer from your own keg. Your friends won't mind either! This system is designed to include absolutely everything you need to dispense your homebrew on draft. Only the best equipment... dual gauge regulator, so you can tell the pressure in the keg, as well as what is left in the tank. Includes an Aluminum CO2 tank that will never rust. 5' of 3/16" ID beer line, so your beer drops to the correct pressure and does not excessively foam in the glass. Biofine Clear Clarifier - 1 oz. I hope that I bought what I need. Good deal on a kegging setup. Wanted a quality product to start our legging with. Does anyone store their CO2 tank in the freezer too? Will there be a negative effect to the gas at 38°? Short answer is no. However, you will get false readings on your regulator gauges as they are effected by temperature. I prefer to keep the co2 and reg outside the fridge. Nice new tank. Fits in my freezer perfectly. Great setup. I just got sick of all the effort of bottling and the extra wait time, so I started my search for a good kegging system on a budget. Of all the kegging systems out there from Northern Brewer to Amazon, this is the best deal with having good confidence in the quality. Bought from my LHBS (More Beer store in Riverside, CA) so I received a full CO2 tank ? at purchase. I priced out all the components separately and this package is a great deal. Due to budgetary restraints I searched Craigslist for a few weeks until I found a 4.4 cubic ft Danby all-fridge mini-fridge ($60!! Retail price is like $170). The CO2 tank and keg fit perfectly in there with no modifications to the fridge – just removed all the shelves. Watching YouTube videos I can modify the door to allow for a 2nd keg in there, so that’s something to look forward to for future expansion options. If you are a noob to kegging like I was, here are a few tips. Tighten ALL the fittings on the tubing – there will be some leaks from the manufacturer’s initial torque job. Disassemble and clean the levered dispenser (not sure what it’s called) between batches. For some reason this part will get blocked a tiny bit and will cause the flow to not open all the way and beer will come out foamy even though the carbonation of the beer and the keg pressure are spot on. The 5 gallon Italian corny keg is excellent quality and you really feel like you’ve played your man card when you can tap your own keg of your own hand crafted beer and pour it into your favorite drinking glass. This kit completes me. Placed this system in a 4.4 cuft Danby all-fridge mini-fridge. Fits perfectly. Only one batch so far but love it. Setup was very easy. I've got it set up in a 5 cuft chest freezer using an Inkbird 308 controller. I set the Inkbird to 37F and regulator to 12psi and low and behold beers are pouring out perfectly after a week of conditioning. Beautiful equipment that worked no hassles. Remember to adjust the clips with a flathead screwdriver and the 5lb canister needs to be filled/exchanged at an Airgas or similar facility. Purchased to start to build my kegerator and have one picnic tap when needed. Works perfectly. If you're reading this, you've probably realized that bottling your homebrew is a bit of a hassle, so now you're scouring Craigslist for used mini fridges, and shopping your options for CO2 draft starter kits. Well, good call. This kit is the most expensive option, but the included brand new Italian-made ball lock corny keg makes it well worth it, especially for a beginner. It's really nice to start out with a fresh clean, well crafted brand new keg--as opposed to dealing with possible leaks/infections from dirty used kegs that are likely older than you are. It's not overly difficult to clean a used keg, or to change out all of the seals, but personally I was learning a lot as a newbie diving into brewing, so I was happy not to have to also immediately become a master of keg repair/maintenance/troubleshooting. Also, since you're you've got a fresh new clean keg, you can be 99.9% certain that any issues you might have with your beer are not coming from your keg. If you can afford it, this is the way to go. 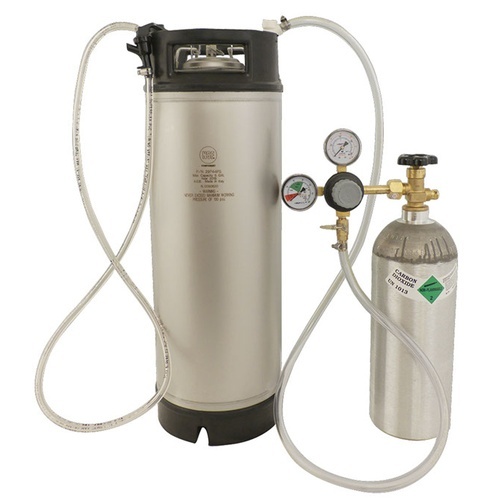 This is a great value keg system that comes with a new AEB keg. The keg is superior, along with the rest of the equipment. However, the beer line on this system comes with a 4ft serving line. 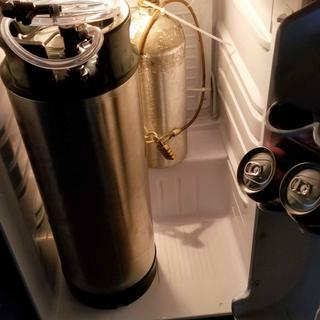 I like to carbonate and serve my beer at 12-13psi and the serving line is too short at 4ft which produces foamy and then flat beer. I would suggest buying about 13ft of beer line and problem solved for a few extra dollars. Great system, totally worth the money. I could not find anywhere else that paired the whole keg system with a brand new AEB keg. Everything you need to start kegging, except temperature control. Pretty basic start up for kegging. Everything you need except temp control. Arrived in great condition and is a great way to start legging. Be sure to clean thoroughly once it arrives and you should be good to go. Everything was packaged well and easy to setup. Both the keg and the CO2 tank are high quality and very cool looking. Everything I needed to get going with a basic keg system. Everything arrived in good shape and seemed like a good value too.